Spanning 3 city blocks, Fashion District Philadelphia will be the largest cohesive retail project in downtown Philadelphia. 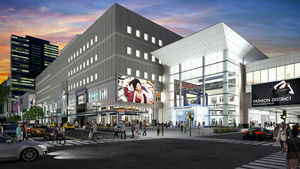 Conveniently connected to Reading Terminal Market, the Pennsylvania Convention Center and the largest regional rail hub in Philadelphia, Fashion District Philadelphia will offer 838,000 SF of the best designer brands and artisanal dining experiences. Note: The above descriptive information came from the district's home page. Fashion District Philadelphia officially has an opening date, Philly Voice, November 8, 2018. Opening of Philly’s Fashion District pushed back another year, Curbed Philadelphia, August 2, 2018. This page was last edited on 8 November 2018, at 12:57.